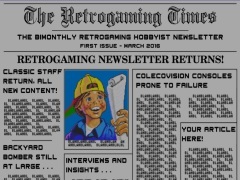 The retrogaming Times is een retro computer magazine (Engelse taal) voor alle retro computer fans. In deze editie: Prepare to Qualify, Upcoming Events, More C64! - The Legend of Atlantis, Organism, Apple II Incider, Nintendo Switch Outsider, Sly Spy, The Magical Reunion, One Man's , Pac-Games - Atari 5200, California Extreme 2018, A Pirate's Life For Me (CoolBoy 198 in 1), The Controller Chronicles - Sega Master System, Weekly Retrogaming Trivia Recap and See You Next Game.